Frankenstein‘s monster is alive and well and living in Eureka! Sort of. The past two episodes on one of my favorite shows, depicted human’s bringing the dead back to life. Well, technically, Holly was only physically dead. Her entire consciousness was stored in a super computer. 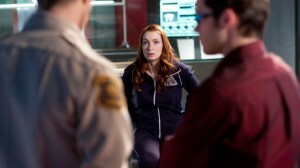 Super geniuses Zane, Henry and Grace were able to build a bio engineered body and download her mind into it. After a slight mishap where Holly started loosing her grasp on reality, they were able to fix her and make her good as new. How close, though, are scientists to being able to accomplish something like this? And what would the ramifications be on our society if we could just download our minds and personalities into a computer and then transfer all that info into a bio bod? Well, for decades scientists have been researching something called a Strong A.I.–an intelligence which could either match or surpass human intelligence (and again I say, Skynet.) Scientists are positing that one of the ways to create the S.A.I is to map and scan a biological brain, in detail and then copying it into a computer. From there, researchers would be able to run a simulation that might actually mirror the original brain. However, because a human mind also encompasses emotions, personality, a lifetime of memories and an awareness of being that current A.I.’s do not possess, how close to human could an S.A.I. actually come? And if this process were unable to capture all of what’s in our minds, then how would we be able to truly download our entire selves into a computer and then into a bio bod? Also, there are those who believe that our brains are so complex that it would take a super computer to hold it. One of my favorite Novella’s by Matthew Hughes called Quartet and Triptych (Luff Imbry is the man!) also tells about the uploading of our conscious minds into “Life Masks” that could be worn by the living so that they could interact with those long dead. However, unless the mask is being worn by the living, or hooked up to an Intergrator (a piece of A.I. 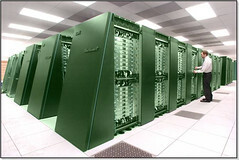 technology used for several purposes in Hughes’ novella) the consciousness inside is doomed to a gray and dismal existence. So if it takes a super computer to hold our minds, then would mind transfers into bio bods be possible? According to futurists and some scientists, Mind Uploading is the future. But is it a future that we should herald in with applause or trepidation?